Is this 8 Day Challenge for you? Be the best thing that happens to your Horse today! 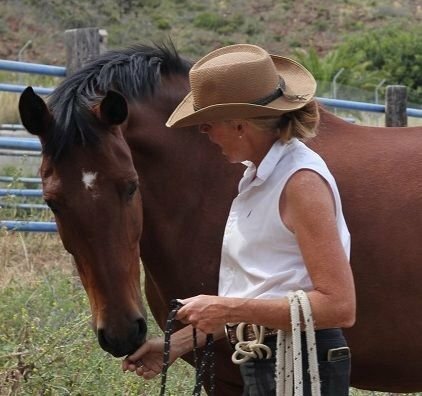 Join my Free 8-Day Connection Challenge: The Soft Approach and discover ways of transforming the relationship you have with your horse. Next one starting in February 7th, 2019. If you would like to be join... please leave your email address below! Hi! My name is Monica, known to many as The Softness Training Coach. My passion in life is to help anybody that is involved with horses in anyway to be the best partner they can be for those horses. That is why I have created The Softness Training Programme to help me share my knowledge and experience with as many people as I can all over the world via my on-line courses and coaching. I have been involved with horse for over 40 years and experienced all the highs and lows that being around horses for that long can bring! I have followed many masters, learnt many lessons, made thousands of mistakes, fallen in many potholes. I have searched for answers in many places, studied many courses and observed many horses, too! Softness Training is about looking at our horse for the answers. About reading their body language and responding accordingly. About working with our horse's thoughts, as well as with their bodies. It is also about looking at ourselves... about being soft with ourselves. Over the years, I have helped hundreds of competition riders, amateur horse owners, horse sharers, riding school riders, once-a-week riders and holiday makers on their "bucket list" horse experiences become better partners for their horses. Some of these people were after creating a special connection with their horses. Others wanted help with creating softness in the work they do with their horses to improve performance. Others yet, wanted help understanding their horses better, or to loose their fear and improve confidence. Time and time again I have found that the softer our initial approach is to the horse each time we meet him (whether in the field or in his stable), the softer and more connected the whole session for that day is. The horse is more relaxed and connected, more willing, more open to interacting with us and, as an added bonus, safer to be around! There is so much I would like to share with you to help you create that partnership we all dream of with our horse. As a first step, I would like to invite you to join my free "8-Day Challenge: The Soft Approach" and send you my free "Connection Checklist". This will be a good way for you to get to know me and see if Softness Training is something you would like to include in your everyday dealing with your horse. This is where it starts.... at the very beginning! Join the Challenge and get your Free "Connection Checklist", right now! Enter your email below - I can't wait to send it to you! everything is really good and you just want to make it even better! Join the Challenge and request your Free Connection Checklist Here! What will you need to complete the Connection Challenge? If you want feedback, you will need a camera (smartphone?) and be willing to upload your video to the group. Some time to spend with your horse! You will receive an automated email asking to confirm you want to want to join the challenge. This helps me stay out of your junk box. I will send you an email with all the details on how to join the Soft Approach Challenge. I do this manually (better with horses than computers!).... so please give me a few hours. You will be invited to join a Facebook Group where you will receive support, be able to ask questions and upload your videos for feedback. More details will be in your email. See you soon! "My horse Napoleon is a difficult horse. He lacks confidence, shuts down and can be very nervous in certain situations. Working (with Monica) has helped us develop confidence in each other and also form a true partnership. I had not ridden him for a year and have owned him of 2 years. I can not thank you enough, Monica. I never thought I could have such a happy boy under saddle". "...Following this course has certainly taught me to slow down and listen to my horses and take the time to connect rather that rush in and assume she was happy to do what I expected or asked. My connection with Xena has grown much stronger as I new take the time to connect and read her body language from the moment I walk towards her." As a horse owner for over 50 years, I have experienced many trainings.... I was absolutely delighted to discover that Monica's Softness Training was able to take my relationship with Rosie even further. Whilst the subtleties are simple to implement, the results are profound! ."... I have seen a huge change in myself and even had a compliment from a friend on how I have softened myself. I am teaching differently, too. I am reading the horse more and seeing when they want to be with us and when they are saying "no, not today". With this beautiful approach, I am witnessing a change in horses within 5 minutes of being with them." I would love to hear from you and let you know what is going on at Softness Training. Like me or Follow me!